My dear late mother always said when one door closes another opens. How right she was. Confined to my home – can’t drive, can’t walk – after a really stupid domestic accident, I find myself increasingly bereft of my loss of mobility and freedom. Each day is the same. After reading the morning newspaper, being showered by a kind Blue Nurse and checking my emails – I’ve taken to actually reading the spam, how sad is that? – the day stretches ahead with only the pain relief medicine schedule to keep me alert. I’ve completed many web searches of the human skeletal frame, in particular the pubic rumis, a part of the complex pelvic structure, to see if there’s a magic pill to hasten its mending. Just rest, drugs and physio is all that is offered to suffers. So, I flop into a soft and comfy chair on my back patio where I can view, but not touch, my five lovely girls – three bantam Light Sussex hens and two bantam Rhode Island hens. David Attenborough-like, I take note of their every movement and study their intriguing social behaviour. I lament, not for the first time, the marauding flying rats – pigeons – that swoop in large numbers upon the girl’s feed. The girls’ pecking order is well established. Rhode Islanders, Tabloid and Broadsheet, share top billing. Next comes youngsters Juliet and Audrey. Only the fifth sister, Henrietta, who inexplicitly some years ago, opted out of poultry society, apparently exists in her own place. Curiously, Audrey has always been at the bottom of the order, even though her closest sister, Juliet is many times smaller. Juliet is feisty and has for the past six years kept Audrey in check. Pecking and chasing the hapless Audrey away from the food and pushing her down to the lower perch. If you’re a chook you have to know you place. But last week, Audrey made a surprise move on the cocky Juliet. Not brave or audacious enough to take on the big players Audrey has enough coop smarts to start her regal claims with knocking off the domineering midget Juliet. It was a raging battle which captivated me for some hours. Audrey jumped on Juliet’s back, gave her three or four pounding pecks and chased her under the tree where she cowered for about an hour. Buoyed by her victory, Audrey strutted around full of herself until her front bench colleagues held a secret political meeting from which Audrey was shunted. There followed a combined counter attack that left Audrey again retreating to the far corner roots of the six-metre Camellia tree and Juliet back in her second-from-bottom spot in the hierarchy. I check my emails again and decide to browse around online shopping sites for an interesting purchase – a poor substitute for the mid-year March sales. I happen upon a talking clock with a crowing rooster alarm. Perfect. Then a lovely decorative, folding walking stick for when I graduate from crutches to a stick. It comes with a nice carry bag that fits neatly into a lady’s handbag. Sated, I return to the back patio where the avian Vikings are again looting and plundering the chook food. In the two years since I moved into this house, the pigeons and I have been in a bloody war. Ok, not bloody. My first attempt to be rid of them was a clever chook-feeding device, Grandpa’s Feeder, that required my girls to step onto a light metal plate to open the box to the food. Alas, the sudden movement was just too scary and so they went on a hunger strike until I removed the offensive device. Next, I tried the old CD trick. I hung one hundred shiny discs from the Camellia tree and strung extra lines from one end of the coop to the other. Avian aversion theory has it the moving sparkling objects will frighten off the fly-in fly-out fiends. This technique proved somewhat successful. The grey demons massed on the roof behind the coop for two days. Then one scout ventured over the coop in a heroic reconnaissance. Unchallenged, it called forth the mob of waiting troops who came, ate and left. Moaning on ad nauseum to a dear friend and naturalist about the interlopers she told me to put some rubber snakes around the coop because pigeons are scared of snakes. Great idea, except these little buggers simply sat on the snakes and pecked at their fake heads. Next I spent a Saturday building the ugliest scarecrow imaginable. I stuffed a Halloween mask with a small volley ball and attached it to a padded pair of St Vinnie overalls. 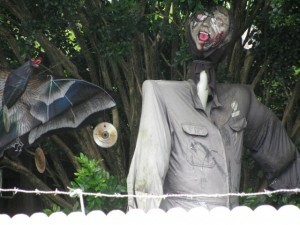 I splashed sparkling paint over the overalls to make the outfit even more scary and strung it up on the Camellia tree. It sure scared me and a small child who visited the chooks that day. Again, I claimed victory, only to discover some days later, the undaunted, greedy pests had returned. A few weeks later I read an architectural article about the use of razor wire on high rise buildings to deter, you guessed it, pigeons. Sadly though, Bunnings does not carry razor wire so I settle on the domesticated version of barbed wire. I strung it around all of their staging areas and waited. For two days, the enemy again massed on the neighbouring roof. Some brave souls did flyovers but they stayed away. But late on a Friday evening a week later, I returned to my sanctuary to find the biggest flock of pigeons I had ever seen, perching on the barbed wire! I gave up and ordered yet more chook food. But yesterday, while I was entertaining myself on shopping sites, I had an epiphany. Searches for “guns, automatic machine guns, weapons of mass destruction” revealed to me that, for some reason, it is unlawful for Australian citizens to buy or use a sophisticated military weapon. Fortunately, my mother also taught me to be a creative thinker. So I began searching for a “very loud and durable cap gun”. Believe or not there is an online store in Victoria that exclusively sells cap guns. 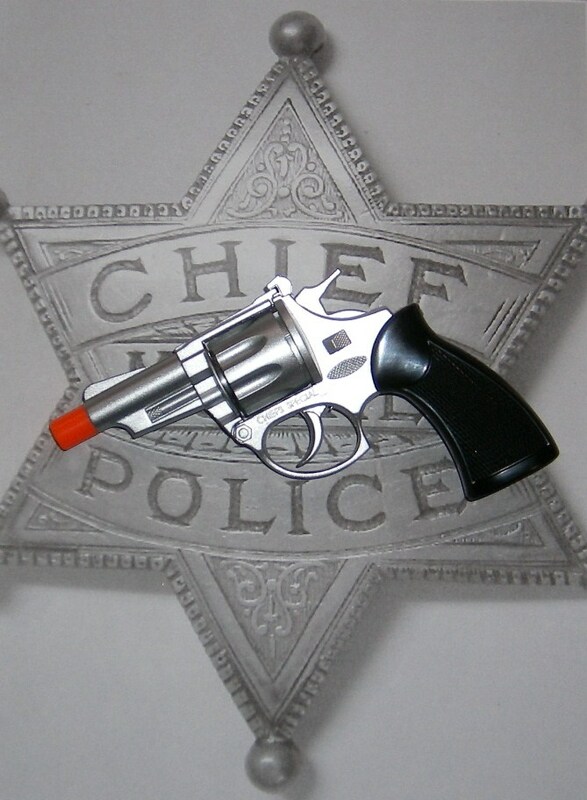 After some deep and meaningful email exchanges with the proprietor, John, I ordered the: CS – ‘CHIEF’S .38 SNUB NOSE SPECIAL – 16cm die-cast metal 8 shot toy cap pistol, brushed finish with black grips. Push button action breaks open the gun for easy loading of 8 shot caps! It comes with this warning: CAUTION: If you’ve purchased a toy cap gun, this product can be mistaken for a real firearm by law enforcement officers or others. 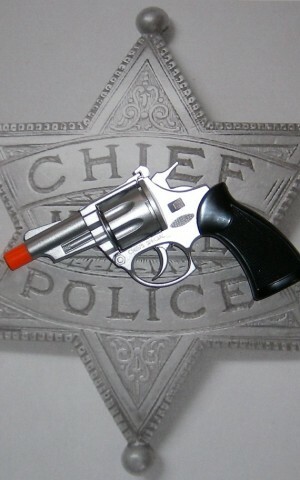 Altering the colouring or markings on this item to make this item look like a real firearm is dangerous and may be a crime; brandishing or displaying such an altered item in public may cause confusion, may be a crime and can be dangerous. Cap guns should not be fired near the face, eyes or ears. Make sure children understand the safe use instructions supplied with toy guns. I await with rising glee the arrival of my arsenal, including an ammunition cache of 995 caps for a miserly $9.95. You’ve half convinced me to invest in some chooks, just so I can see the startled faces of those fly rats when I let lose with a cap gun. Oh please let me know if that cap gun idea has worked! (and maybe provide a link to the website). I am desperate to get rid of some mynah birds that have claimed my outdoor area as their own. I am sick of bird poop on everything otherwise I wouldn’t mind them. I tried scare owls that you hang up and they work like your CD theory. Or rather DON’T work, however they make a nice decoration. The same goes for the black silhouette of a cat. My dog is useless and so I am considering a cat but I am not a fan of cat fur either. Scratch that idea. No pun intended. So far rubber snakes are working to a degree. I just have to remember to move them about. Dammit, those are sold out now. I was hoping to get one to keep the neighbours two big dogs from continuously attacking my two cats at our own front door while forcing their heads in through the cat door. It seems I’m not safe in my own home.